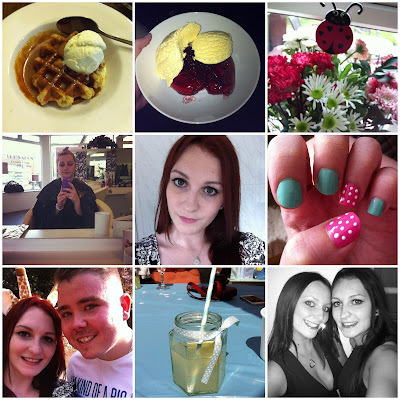 So, mostly of these pictures are from this weekend but ive had such a busy one I decided to include them in a Photo Diary! I had Friday off work as me & Scott were going to Zoo Lates at London Zoo - I wont go into too much detail about that because im going to post all the pictures & what we did in a separate post; but it was such a good evening! Friday morning I decided to get my hair died & cut again, I wanted to treat myself and im so happy because im loving the colour :). I also went to a baby shower on Saturday for one of my friends' friends and it was such a lovely day, the weather thankfully held out until we decided to call it a day and bring all the sweets & lemonade inside! I then had a leaving do on Saturday evening for my friend Claire whose last day at work is tomorrow! Gonna be so emosh haha there was already some tears today! But tomorrow night after work were all going out for a meal and hopefully it wont be goodbye forever!